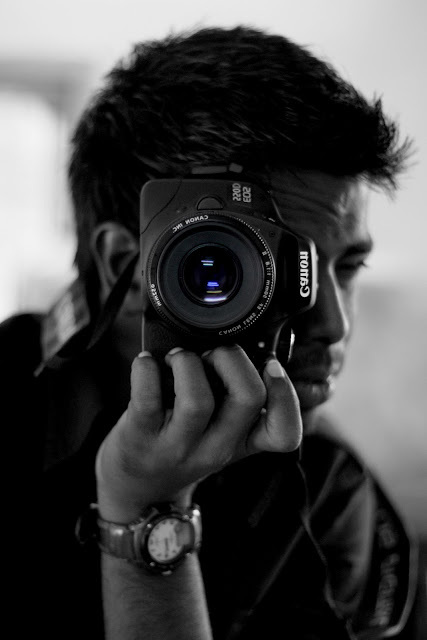 This is the first self portrait I took from my SLR. Nothing planned. Actually when I bought the SLR I want to take a photo of it, since my digi cam was already dead , I thought of keeping the camera in front of the mirror to take a snap. This is what I attempted first when I saw a clean mirror in my friends home. 50mm works magic here especially for portraits. Then just like that I tried taking some snaps with me standing in front of mirror holding the camera and taken some snap some with camera in focus and some with me face in focus. Then I went ahead with the photo that has camera in focus. Then while editing I casually tried black and white mode which stuck me. It was good but I felt it was like just another black/white snap so I added color just for my camera lens.